Recently I traveled to Chicago for a conference. I was honored by the request to give a presentation, so despite the fact I’d rather run myself over with my own car than fly these days, I found myself on a plane to the Windy City. Make no mistake. I knew it was called the Windy City before arriving. That’s why it was that much more surprising to discover, once I’d arrived at my hotel and was freshening up, that I’d forgotten to pack a brush. OR a comb. An adventure – how fun! I walked off, a spring in my step, to find the nearest drugstore. Because I am directionally challenged at the best of times, forty-seven blocks later I staggered into a Walgreens, absurdly grateful for the air conditioning and even the slightest respite from the glaring sun. Confronted with what seemed to be thousands of hair brushes, I opted for a round one made out of metal and space-aged polymers and ceramics and maybe even dark matter with extra ions and little nubs on the ends of the bristles. 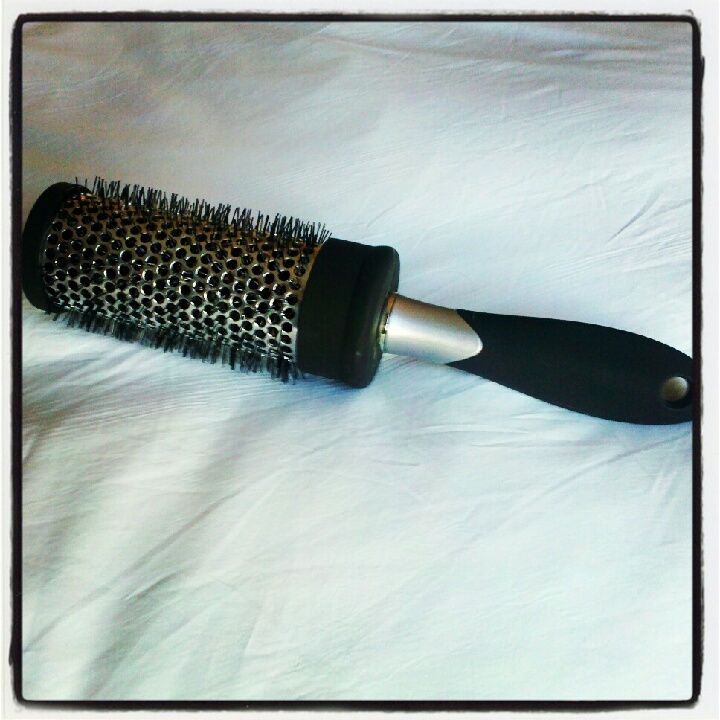 It was also slightly heavier than my normal hairbrush, a seemingly unimportant factor that I would soon deeply regret. It appeared to work in the manner of a normal hair brush that afternoon, and again that evening. Not a problem. A seamless transition, or so I thought. The next morning, I got up early to get ready for a full day at the conference. As I was innocently drying my hair – still half asleep and waiting for my coffee to kick in – IT HAPPENED. The brush got stuck in my hair. When I say the brush got stuck in my hair, I can see you rolling your eyes and thinking, “Please. What’s the big deal? Unroll it and get on with your life.” And normally I’d be right there with you. This time, however, I was dealing with the Evil Hairbrush of Extreme Malevolence. In seconds, it had twisted every single strand of hair on the left side of my head firmly around it, and it was. Not. Moving. For the first time in my life, I was quite literally dumbfounded. I moved on to stunned and slipped quickly into shock. The brush would not move. I tried conditioner. I tried water. I tried loosening the hair strand by strand. I looked up solutions on the internet. Phone a friend seemed to be a top pick, but I was in a strange city and there was no one to call. Using chopsticks to somehow gently pry the hair away from the core of the brush seemed like a viable option, but oddly enough I’d failed to pack chopsticks for a two night stay. In desperation I began to cut the little nubs off the end of the bristles with my travel nail clippers, just to feel like I was doing something. They scattered like depraved cookie sprinkles across the gleaming bathroom vanity and floor. I started crying like Woodstock in the old Peanuts cartoons – tears flingling themselves horizontally from my eyes. It was clear to me I wasn’t going to be able to fix this one on my own. And because the heavy brush was stuck about a half-inch from my scalp, I figured I was returning home with a buzz cut and the mother of all headaches. I called the Concierge. I blinked. Housekeeping? Were they going to Windex the brush free? She gave me the number, and I called, hoping against hope that they’d be open and someone would be available. Now I had a whole new problem – was I really going to walk through the hotel and down the street to a yet- unknown destination with a brush sticking out from my head? 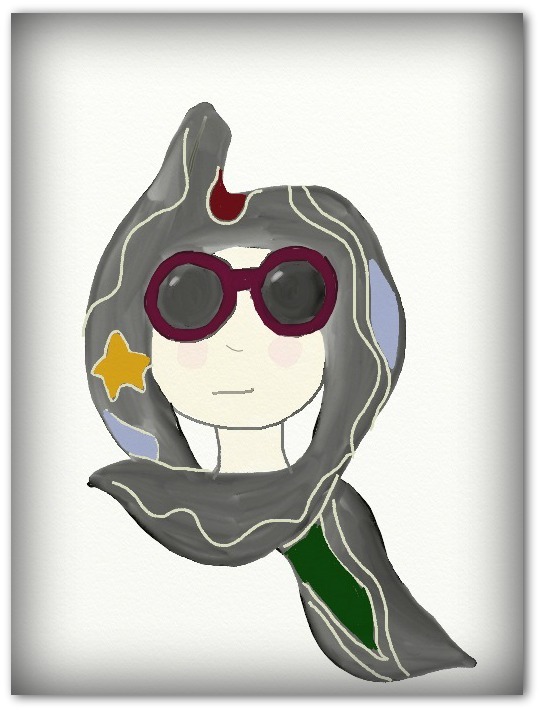 I grabbed a giant scarf and wrapped it around my hair, pretending that the metal brush didn’t make the scarf bulge alarmingly in a way that instantly made the phrase “deformed unicorn” leap to mind. I opted for sunglasses instead of my regular glasses. Even in this city where I knew very few people, I decided to sacrifice vision for anonymity. I made it to the posh lobby without incident, and sidled up to the Concierge station. A woman in front of me was negotiating for a pedicure. I waited as patiently as I could, feeling like I was standing under a neon sign flashing *FREAK! CAN’T BRUSH HER HAIR! * on and off for the entire world to see. I tried and failed to NOT wish horrible, debilitating nail fungus upon the long-winded yet reasonably innocent woman standing between me and directions to the salon. Because I was still in shock, the Concierge had to repeat the directions four times. Even then, walking out into the bright sunlight, slightly dazed, all I remembered was right, two blocks, then left. Or maybe right. Surely it couldn’t be that hard to find. In the end, I only went about twelve blocks out of my way. I finally walked up the steps to the salon with a strange mixture of relief and trepidation, tried the handle only to discover that the door was locked. I knocked quietly. No response. I knocked slightly louder, trying desperately not to offend anyone who might be able to help. Someone finally let me in. A kind-looking woman walked over to greet me and motioned me to a chair. “Take off the scarf,” she said. I slowly unwound it, eyes fixed on my lap. She blurted out, “Oh my god!” and I burst into silent tears, bottom lip quivering. “You’re going to have to shave it all off, aren’t you?” I sobbed quietly, like this was the worst thing that has ever happened in the history of the universe. All sense of reason and perspective had left the building at a run about an hour before and were still gaining speed somewhere off in the distance. “Let’s see what we can do.” And she went to work. Thirty minutes later, the brush was free. She tried to hand it to me but I averted my eyes and made useless flapping gestures with my hands. “I don’t want to touch it, I don’t even want to see it. I think maybe you should shoot it or burn it.” I said this earnestly, then asked her how much I owed her. “Don’t worry about it, ” she said. “Just no more crying. You need to smile more.” And she patted my arm. Then she explained how to pick out a brush that was NOT the Unholy Hairbrush of Impending Doom. So I gave her a watery smile and an enormous tip, and sent her flowers the next day. I may have even promised to name all future houseplants after her (it didn’t seem right to promise to name future dogs after her), but things got a little fuzzy there at the end. I was free! I skipped down the street, puffy-eyed, tender-scalped, dehydrated from stupid amounts of crying, horribly frizzy and totally unstyled hair streaming behind me in the furnace-like summer breezes of the Windy City. And for that moment in time, I was blissfully and ridiculously happy. I’m so happy that Jason Konopinski shared the link to your story. It was a delight to read. Also, I’m no longer mystified by the “hairbrush of doom” reference. 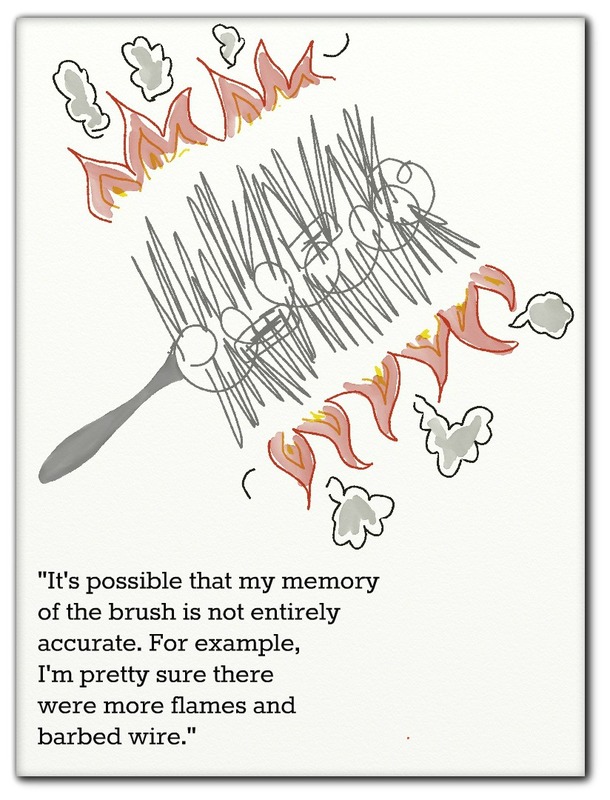 Just saying “hairbrush of doom” almost causes me to giggle. Oh my gosh! This is so funny I could barely keep reading through the tears in my eyes! I now need to go back and read all your posts. Hilarious! Hahahaha, thanks, Iggy! Big hugs to you both. Unbelieveable. I ruined a perfectly good bladder pad, thankyouverymuch! I live to amuse the Guyers, as you well know. Hugs to all! Welcome to my life, the meaning of which is to serve as a warning to others while making them laugh. Or something like that, anyway. And thanks for stopping by! Yep, Jane, this whole episode comes as no surprise to those who know me. Glad to bring you a smile (or uncontrollable laughter – either way). You tell a marvelous story, Mickey. I laughed so hard as I read this. And felt your pain -as a klutz who has also spent hours through tears teasing a tangled brush free of my head. How you turn around this moment of personal panic with such charm made my day. Listen to Mom. I, too, want the book! Oh, Diane – thanks so much! It’s good to know I’m in such good company. 🙂 We’ll see what happens – at this point, I’m mainly telling the stories folks have been asking me to write down for years now. Stay tuned! You really do need to write a book of anecdotes on your life and travels. I now know exactly how to evaluate everything you ever do from now on. Don’t you DARE. Ah, well, at least I’ll know it’s you. OK. I have to admit, when you said you’d done this, I didn’t believe it was THIS bad. I really thought you got it caught in there and were able to get it out yourself. I’m so glad I wasn’t around or I would have come over, taken pictures, laughed myself silly, and THEN helped you. OMG! I can’t BELIEVE how small the world is these days. Shannon, you are unquestionably the BEST Concierge ever. I can assure you that my reaction to a similar phone call would have been to put myself on hold and laugh until I cried. But you? You didn’t even miss a beat, immediately offering suggestions without even a SINGLE muffled snort. AND you were so amazingly patient when I couldn’t grasp even the most basic directions (“Was that right, straight two blocks then right.” “No, right, straight two blocks then LEFT.” “And then right?” “No, and then it’s on your left.” “Could you draw it on my hand?”). In my defense, I wasn’t really at the top of my game. It’s nice to find someone who witnessed the story as it unfolded. Real life really is stranger than fiction, especially for me it seems. I couldn’t make this stuff up if I tried. And I hope the pedicure woman never finds this blog. I adored the Blackstone and raved about my stay – the hotel, my room and the staff were all amazing. And special thanks again to you for being awesome! PS: Hope it didn’t take Housekeeping too long to clean the little hairbrush bristle ends off the floor of the bathroom. I considered asking to borrow a vacuum cleaner but figured I’d accidentally catch the end of a roll of toilet paper in it and end up causing even more drama. It seemed wiser to quit while I was ahead. Shannon, I live in Chicago and a big fan of the Blackstone. But after reading your comment, I am sending all of our out-of-town clients to stay with you when in town. HOW COOL is it that you commented?!? I’m impressed. Brilliant and reminiscent of an incident that blessedly took place at home. Brush rapidly hit trashcan after extrication from my hair. So sorry I missed responding to this earlier, Penny – I’m glad to hear that your brush event played out in the sanctity of your home. I really do hope the hair stylist burned the one she extricated from my hair before it spawned. Ugh. Thanks for stopping by! It’s not the first time you’ve made me snort, but it may be one of the best. I don’t know why these things happen to you, but I’m so glad you choose to share them! Laughed out loud about five times. Had to cover my mouth. My eyes welled a bit. Then my job here is done. Thanks, Tom! @ShellyKramer sent me this post via email and OMG, I’m so glad she did. I love your writing style and could envision the entire thing happening to me as I read it. Signing up now so I get your posts via email in the future. Thanks for bringing a smile and laughter to my day. Seriously the funniest thing ever. I love your take on the world. Priceless! Mickey, I didn’t know anything about you before reading this. I suppose I really still don’t. But, the piece started my rainy Tuesday off with an honest-to-God laugh-out-loud. Thanks. Dan, thanks so much for your kind words. I love the thought of making folks laugh – especially the omg-can’t-help-it-laugh-out-loud type – so your comment makes me happy. Cheers! If I didn’t know this was true…. Mickey, your everyday life adventures give me some great laughs. Please don’t think I am glad that they happen to you instead of me. Well, maybe just a little. I couldn’t tell the stories as well. Thanks for sharing! Jeffrey – you have no idea how often people who hear my stories say, “You really need to write that down.” I can’t tell if it’s my offbeat take on the world or an above average attraction to absurdity. Maybe a mix of the two? In any event, glad you enjoyed it and thanks! R we related? I have been in this exact situation before & more than once. I only buy all plastic brushes now with no real bristles or barb wire. For future reference, don’t ever use those hair products for thinning hair or you will discover the same result without the luxury of a handle. Hugs and mousse to you! Hahahaha, excellent advice! I’m tattooing it on my forehead now. Thanks, Sue! Just. Plain. Wonderful. Thank you for sharing. Mickey, while I am laughing at the drama, I’m sorry that happened. I do like your choice for the Hairbrush of Lesser Drama. It seems to be more manageable. Hair’s to you, I mean, here’s to you! 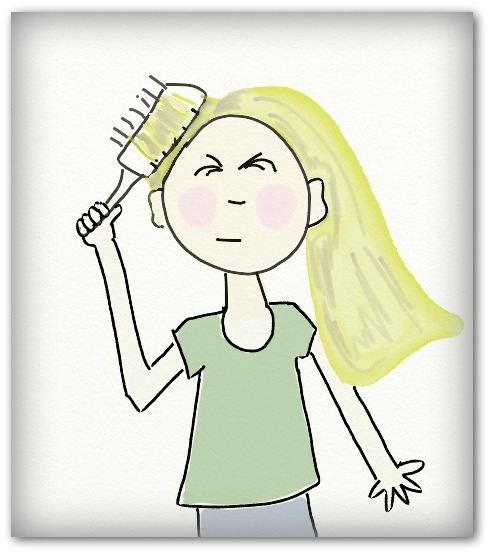 And really, doesn’t everyone need a Hairbrush of Lesser Drama? Thanks, Stacey, for reading and I’m glad you enjoyed it. Mickey this is such a great story. Thank you for sharing it. So glad you liked it, Allyson – thanks! I’m not sure which was more delightful – your writing or the delightful illustrations. LOVED THIS. Hey, thanks so much, Amy! It really means a lot. This was one of my first attempts at digital drawing. The number of people who asked if I’d taken a photo of myself with the brush stuck in my hair was unbelievable, so I had to do something and I surely wasn’t going to re-create it. At least on purpose. OOOMMMMMGGGGGGGGG. I HAD to do this. Yes, I am crying…but from laughing SO hard. Mickey Gomez, I am only half-way through your blog post and it is THE best thing I have seen, heard, read, stumbled-up – you name it – EVER. I just had to share my expression with you. I am literally sob-laughing. You know that weird in-between sound? You made my year. Sorry it had to come at your expense. OMG. Sean, I can’t wait to hear it, either – I hope you’ll stop back in and share if you get a chance! This happened back in mid-June, if that helps. I will say the Concierge was great and didn’t burst out laughing even a little bit (in my hearing, anyway). And thank you for stopping by and commenting. Yep. My twitter pal was the concierge on duty that day. We’re totally laughing it up over on twitter. Hoping she’ll comment here. LMAO! Oh Mickey. This is so fabulously funny. I have been happily sitting here reading and cackling away just about every other sentence. You really do write so well. I am pining for the book. xoxo Whatnot.